ADJOURNMENT OF THE STATE CONVENTION. The labors of our State Constitutional Convention are rapidly drawing to a close. That body a few days ago adopted a resolution to adjourn on the 31st inst., which would make their session a few days over four months in duration. The revised Constitution as it will be presented to the people, will differ materially from the present one. 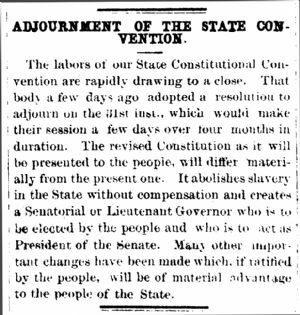 It abolishes slavery in the State without compensation and creates a Senatorial or Lieutenant Governor who is to be elected by the people and who is to act as President of the Senate. Other important changes have been made which, if ratified by the people, will be of material advantage to the people of the State.